The MOD Duo first jumped onto my radar when I was in Berlin working with Cycling ‘74 engineer Jeremy Bernstein - I was there the week prior to the 2016 Ableton Loop event, and I tagged along with Jeremy to a few meetings. One was with a startup company called MOD DEVICES, who had recently funded a successful Kickstarter campaign to launch their hardware device - the MOD Duo. It was love at first sight - similar to my beloved Nord Modular, but with the power to do a lot more and the opportunity to use modern programming languages to extend its functionality. At first glance, The MOD Duo looks like a guitar pedal - but a closer look will quickly suggest that it’s a lot more than that. 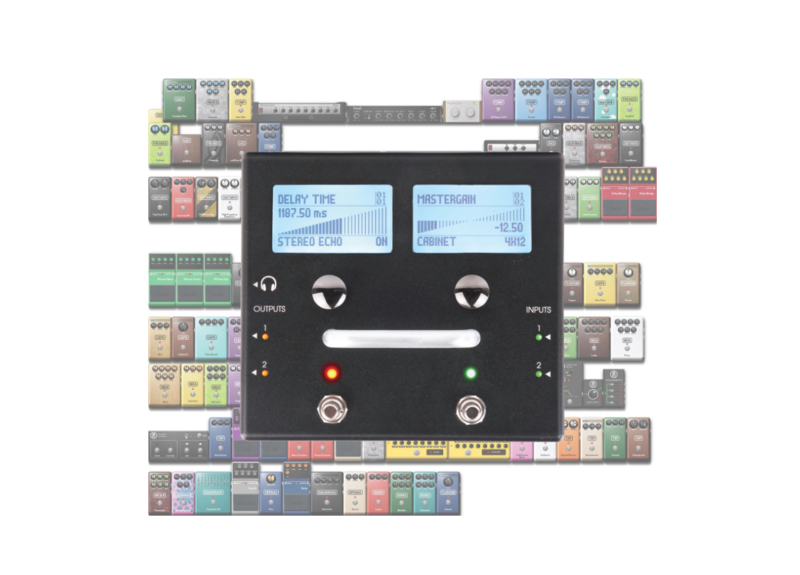 The MOD Duo allows you to set up virtual pedal boards made up of modules/pedals that range from MIDI devices to audio effects to signal generators - and beyond. The virtual pedalboard setup all of this happens within a server on the MOD Duo pedal itself. 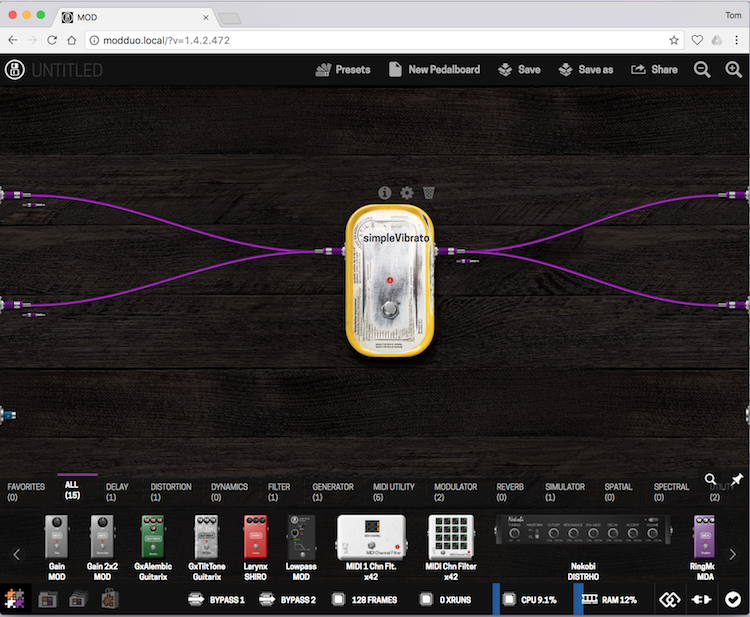 Once you’ve finished making your pedal board, you can run audio through the hardware in real-time while you are designing it. By the way: you simply save the pedalboard you’re designing on the MOD Duo and unplug from the computer. That’s it - you’re good to go. There’s no need to reconnect to the computer again (unless you want to change the combination or configuration of pedals on your virtual pedalboard). You can also design multiple pedalboards, save them onto the MOD Duo and switch between them without having to reconnect to the computer. You’ll find more details on the MOD Duo ecosystem in my colleague Darwin’s overview article. The included MODwatcher patcher allows you to export gen~ code from Max directly to the MOD Devices cloud compiler without leaving the Max environment. To accomplish this, the MODwatcher patch contacts MOD Devices’ server and uploads your exported source code. Their cloud compiler then converts your exported Gen code to a compatible LV2 plugin and sends it back to the MODwatcher, which then adds/uploads it to the MOD Duo - an entire round trip with a single click in the patcher! This means that you don’t need to mess around with browsers, terminals, etc. It provides a seamless process for exporting from your gen~-based code straight to your MOD Duo hardware device. Your newly compiled plugin appears as a ‘pedal’ in the MOD Duo pedal-patching environment in your browser and is ready to be incorporated into your setup. The other part of the package is a collection of gen~-based patches created by MOD Devices that have been modified to provide compatibility with their hardware. There are just a few basic guidelines that need to be followed to ensure that parameters you add inside your gen~ object match up with the control points on the pedal. If you dig into the patches which have been created and documented by MOD Devices, you can quickly learn how to get your Max patcher ready for the hardware. After the installation is complete, click on the new “Launch” button. What you will see is the MOD-Duo Launch patcher from which you can access everything included in the MOD Duo Package. From the MOD-Duo Launch patcher click on Simple Vibrato under Examples. An important part of these example patches is the message that we need to send to the gen~ object so that it can communicate with the MODwatcher. Inside this Vibrato example patcher, you will see a message box connected to the gen~ object containing the text exportnotifier MODwatcher, exportcode. This tells the MODwatcher to watch the patcher, and - when the code is exported - to commence the process of uploading it to the MOD Devices cloud compiler. Note that this all happens within the patcher! Once you’ve completed your gen~ patch and you want to put it on your MOD Duo, click this message box and you will see the MODwatcher start to complete its round trip process to the cloud, back to Max, followed by an upload of the compiled code to your attached Duo. Fire up your browser and navigating to your MOD Duo. In the list of devices you should see simpleVibrato Max gen~ available of inclusion in the MOD Duo virtual pedalboard environment. You can now include your compiled gen~-based Max device inside of any of your MOD Duo setups, and it will remain available and loaded on the MOD Duo for future configurations. You can design your own gen~ patch for the MOD Duo by creating it from scratch, but it is probably easiest to start with the Empty Effect patch as a good starting point. Be sure to check out past Gen tutorials as well as information available at MOD Devices.